2. Download, read, print off and sign the veterans terms and conditions here. 3. 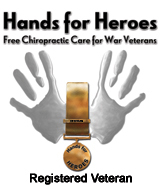 Locate a Hands for Heroes chiropractor near you by searching at the "Find a Chiropractor" page here. 4. If you cannot locate a "Hands for Heroes" registered chiropractor then use our letter template and instuctions to send a letter to a local chiropractor to encourage them to join this great scheme. a. your Hands for Heroes Veteran's Registration Certificate. b. your signed Terms and Conditions. c. some picture ID (e.g. military ID card or driver's license or passport). d. YOUR SERVICE REPORT for the period you served in either Afghanistan or Iraq. Enjoy Your Care And We Look Forward To Hearing About Your Experience!